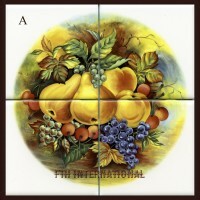 Ceramic Tile Murals with Matching Accent Tiles - FTH International Sales Ltd. Many of the mural designs you will find listed here can be created on either 4 inch or 6 inch square tiles. Please check the information contained in each listing to see what sizes are currently in stock and what other sizes of tiles the pattern you are looking at can be fired on. 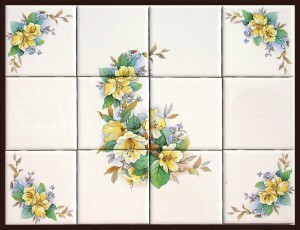 Each Mural listing will also let you know if there are matching or complementary accent tiles available for each design. Please contact us if you have any questions.